Internal migration volumes of young people have increased markedly between 1999 and 2013. At the turn of the millennium there was a smaller net inflow of young people into three outer boroughs: Havering, Barking & Dagenham and Bromley. Scope has increased fivefold since 1999; by 2013 there were 15 outer boroughs experiencing a net inflow. By volume outer boroughs bear the brunt of internal movements. Inner London in stark contrast experiences the strongest net loss. Westminster, Lambeth, Southwark, Tower Hamlets, Newham, Hackney and Haringey all experience the greatest net outflow. Movements of looked after children (LAC) are much starker; positive net gain is only experienced by outer boroughs, whereas on the whole inner boroughs experience a net loss. When outer boroughs experience a negative net flow these flows are weaker compared to those experienced by the inner boroughs. 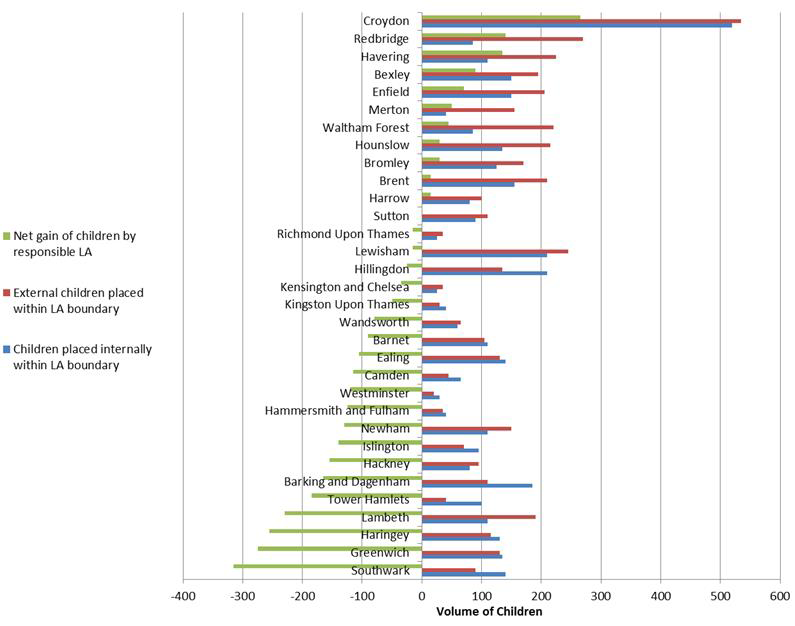 Croydon has the largest gain of LAC by net flow; but also experiences the highest levels of external and internal children placed within its boundaries. Broadly outer boroughs make the lowest proportion of LAC placements across local authority boundaries. Inner boroughs now place much higher proportions of children across local authority boundaries. Trends of pupil mobility in terms of non-standard school admissions (in-year admissions) play out differently to the broader migratory trends of young people. Over a five year period between 2009/10 and 2013/14 pupil mobility in both inner and outer London was about 20 per cent higher than other regions. Northwest and west London (including Brent, Harrow and Ealing) and pockets of east London (Newham and Barking & Dagenham) have experienced the highest rate of non-standard admissions throughout this period. Broadly rates south of the river have remained lower, although not without variation between boroughs. Trends speak of a pupil population in flux; the pressure on school places coupled with highly mobile households means that young people are being subjected to increasing cross-boundary and long-distance school commutes. Crucially, these flows are not simply following lines of affordability, but rather are a complex product of multiple variables, not least, school capacity. It is, therefore, unclear how faithfully these trends reflect residential mobility.